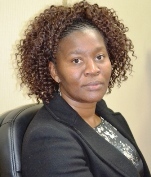 Gugulethu Nyanda is GM of Corporate Services. Before joining Mintek, Gugu was the Managing Director of a consulting company Genius Management Solutions where she focused on organisational development, corporate governance and strategic planning. She was also previously employed as General Manager for Public Affairs at the SABC; Chief Director in the Office of the Director-General and Director: Human Resource Development Planning in the Department of Education in Pretoria. Gugu has also served as a Council Member of the University of Western Cape, where she also served in the Senior Appointments Committee of Council, and a member of the Immigration Advisory Board. Gugu holds a BA (Hons) in Geography, a Diploma in Human Resource Management and a Certificate in Applied Education Economics and Planning.